You know, if I was the dumbest person in the world, I'd offer a service where all the people in the world who have some sort of effect on the opinions of others can broadcast their�thoughts and feelings�all over this great globe of ours, and then I'd piss those people off as profoundly as possible by wrecking their webpages and holing up behind a help page with no contact information, and no help on the page. The two smartest people in the world are that dumb. Think how dumb dumb people are. 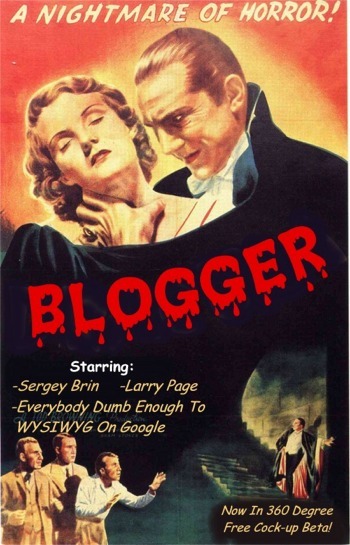 What did Blogger do to you? Looks like it hurt.